• Scottish Fold breeders are listed below alphabetically by state / city. This breed directory page features Scottish Fold Cat breeders with kittens and/or adult cats for sale. 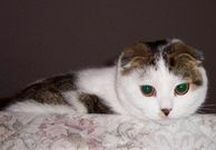 Scottish Fold Cat breeders, you may place an ad for your Scottish Fold Cat kittens and/or adult Scottish Fold cats for sale on CatsForYou.com to find qualified buyers. Georgia - Canton, GA Kittens Scottish fold and Scottish straight - Parents are international championships in WCF. Oklahoma - Ada, OK Scottish Fold kittens for sale - Kathaven Cattery has been in business for 35 years and CFA Registered. All kitten vaccines and worming are up to date, there is a one (1) year health guarantee for any life threating congenital defects, and cattery is FeL V & FIV negative. We do not ship kittens.